There is no strict rule on what type of engine a Resto-Mod should have. Jim Mokwa made the choice to power his GTO convertible with a performance-modified version of a vintage 400-cid Pontiac V-8. This engine is similar to the one originally available as standard equipment in '69 "Goats." In resto-Mod speak this is considered a "factory" engine, even though it has many improvements. GM mechanic Mike Bray helped Jim Mokwa modify his engine. In case you're wondering, it was pulled and put back in the painted GTO because a con rod was just hitting the windage tray. They pulled it and fixed it in one day. 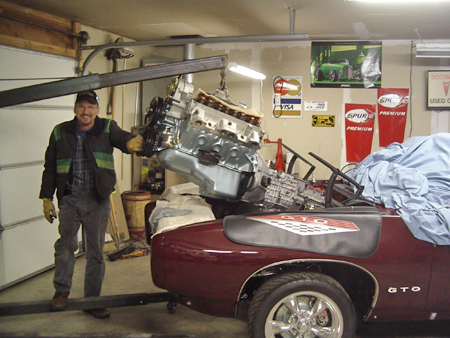 Mike Bray, a General Motors mechanic, helped Jim rebuild the engine and heat it up with hotter performance. They found and used a '68 Pontiac 400-cid block as the base. Mokwa had heard about Jim Butler, of Leoma, Tennessee, a top Pontiac engine builder since the 1960s. He purchased a Butler Performance (www.butlerperformance.com) long-rod 461 stroker rotating assembly, plus ported and polished Edlebrock cylinder heads with 87-cc combustion chambers and installed this performance hardware with Mike Bray's guidance and help. Mokwa built the rest of the engine himself, including the intake system and the carburetors. The car has dual four-barrel carburetors and had a progressive linkage when it was first constructed. 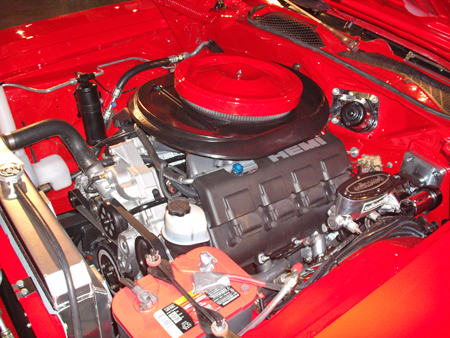 Butler Performance supplied a pair of Doug's Headers made for Pontiac V-8s. Mokwa believes that his GTO's modernized vintage engine is making over 500 hp and he loves driving it. Here's how the GTO engine looks in the car all dressed up with full accessories mounted. This type of Resto-Mod motor is known as a custom build. Another group of Resto-Mod builders prefers even older vintage V-8sâ€”Ford flatheads, early postwar Caddies, Olds Rocket 88s, Buick 'Nailheads' and Chrysler "Firepower" and "Red Ram" Hemis—in Resto-Mods. They say there's nothing cooler than making a classic engine once considered obsolete into a modern engine. By using an engine that's thought of as nearly extinct, hard to get parts for, and totally "era-incorrect" under the hood of a Resto-Mod muscle car, these "engine gurus" are showing others their extreme engine building skills. Nearly all of these engines were long gone by the time muscle cars hit their stride. They were considered "boat anchors" back in that era. But today, there are companies like Egge Speed Shop (www.egge.com), Kanter Auto Products (www.kanter.com), Northwestern Auto Supply (www.northwesternautosupply.com) and Speedway Motors (www.speedwaymotors.com) selling the obsolete parts needed to rebuild the basic engines. Then, the Resto-Mod engine builders add their high-tech magic. 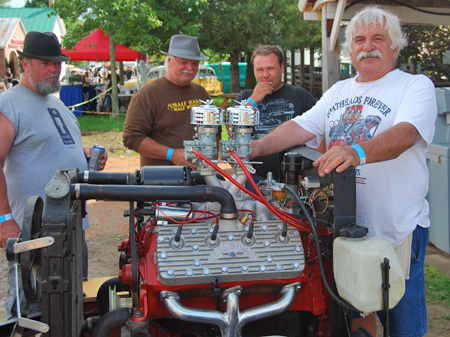 Engine rebuilder "Flatjack" Meyer of Oshkosh, Wisconsin, is known for his expertise with vintage flathead Ford V-8s. 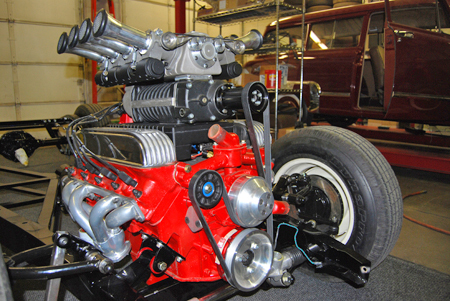 Egge Machine supplied the parts for this engine, which was given away to promote the Symco Shakedown car show. Guy Henson is such a builder. He recently finished a radical 401-cid Buick Nailhead "pump-gas" motor that features such upgrades as a Whipple supercharger and an electronic IAC (Idle Air Control) system combined with F.A.S.T engine management technology. Perhaps it is fitting that Guy took his engine from a '60s Buick Wildcat, since it represents a very wild rendition of an "old" engine—one that everyone thought had been put out to pasture long ago. Henson made the suggestion to use the Whipple supercharger, which he had sitting on a shelf in his Minnesota shop. He then carved a billet intake manifold out of five different chunks of aluminum, put the supercharger on top of it, added a custom-built plenum and topped the package off with eight Hillborn throttle body injectors with individual spun aluminum velocity stacks and filters. Henson carved ribs into the intake to match those in the supercharger so things looked nice. Then, he had the entire works powder coated. He extended the nose of the supercharger by four inches to get the belt alignment to work right. Then, he carved a water pump pulley out of billet and put a crank sensor on it. Since the customer wanted Hillborn throttle bodies and stacks, Guy glued some 2 x 6-in. pieces of wood together to mock up a plenum. He actually laid it out and carved out half of it on his own milling machine. Then, he sent that piece off to be digitized so he could reproduce complete plenums on a CNC machine. Guy Henson's Shakopee, Minnesota shop custom-built a "pump gas" Buick 401 Nailhead V-8 with a Whipple supercharger and Hillborn velocity stacks. A modern power management system hides under a hand-carved intake. The Nailhead's intake allows the throttle bodies to be positioned straight out or tipped at up to a 30-degree angle. This permits a variety of engine bay "looks" with the same hardware. The IAC system motor is hidden in an elbow on the back of the plenum. You can completely close the throttle blades and bring the engine down to a nice purr at idle or you can reach into a car with this engine, bump it into neutral, grab the key, hit the IAC motor and it will start right up. The car has 20 in. of vacuum at idle and when it comes up to the top it will have eight pounds of boost with the Whipple supercharger. The car will start every time and rev up to a certain idle, before coming back down to where it's emitting a nice, lopey sound at idle. But, you still have instant throttle response. For engine management, Henson used a new technolgy FAST (Fuel Air Spark Technology) system that will allow him to "drive" with a laptop computer once he develops a base program on an engine dyno. Using a laptop, he'll be able to tune the motor to behave itself the way the owner actually drives the car. The injectors that actually feed the Nailhead are hidden between the custom intake manifold and the finned polished aluminum lifter cover. Upstairs, where the old injectors would have originally fit into the Hillborn throttle bodies, Guy ran a vacuum line to operate vacuum-powered options. Other dress-up items on the engine include finned polished aluminum Offenhauser rocker covers and steel headers, both sourced from the Speedway Motors catalog. Guy designed the cam in the engine and had CNC grinders make it for him. He uses several different grinders for different designs. The Hillborn throttle bodies are a current edition of a classic design made to modify Chevy 283-cid small-block V-8s for drag racing. Guy made his own throttle blades with a more rounded shape that allows closing them off. They do not have to be slightly open to achieve idle, since the IAC technology takes care of that. Guy devised a number of different ways to run linkages to the throttle bodies. On the Nailhead he used a cogged belt drive off the front of the plenum with belt tensioners. The throttle is in the back and runs through the center of the plenum to actuate the throttle plates on both sides. Return springs are incorporated into the turret barrels below the throttle bodies on both sides. Spring pressures are adjustable. Henson used custom Ross Racing pistons because he likes to decompress Nailheads. Buick used a 10.25:1 compression ratio in the stock piston, but Guy prefers an 8.5:1 ratio with flat top or dished pistons. The Nailhead has huge 125cc chambers and Guy feels that compression can go too high. He says that he prefers an efficient design and feels horsepower is the by-product. The great majority of Resto-Mod builders probably rely on so-called "crate" engines to power their rides. In theory, crate engines are complete replacement power plants that can be bolted into a car as soon as you remove them from their shipping crate. Actually, some of them need to have certain accessories (such as drive pulley systems) added to them before they are ready to install. 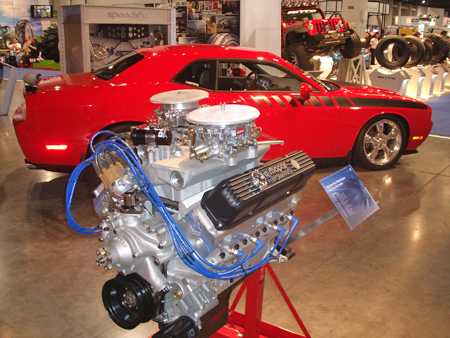 Crate engines come in various performance levels and are sold by both the Big Three American car makers and aftermarket companies. 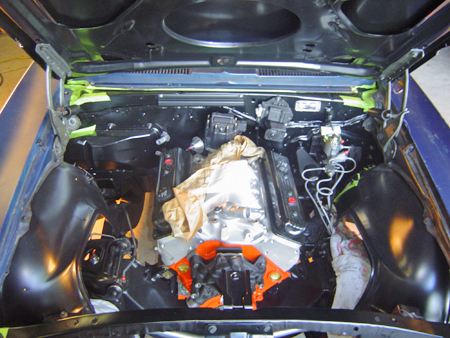 In addition to being ready (or almost ready) to bolt into a car, crate engines are covered by strong warranties. Jeff Noll put this Chevrolet ZZ4 H.O. 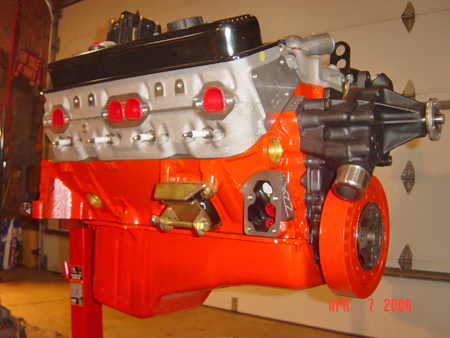 350 four-bolt-main GM crate engine into his orange Camaro. Jeff and a friend used a cherry picker style engine crane to carefully lift the crate engine, with transmission attached, into the car. Tape on transmission keeps it from scratching paint during install. Jeff did not keep the black, ribbed valve covers on the motor. Engine nestled comfortably into place below the hood of the Camaro, which hadn't been finish painted yet. Here is the engine as it looked when the restoration was fresh. Changes include orange "Chevrolet" valve covers and chrome air cleaner. 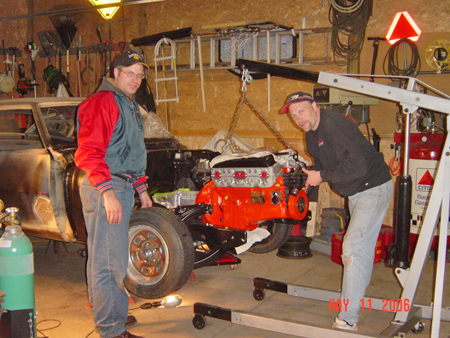 Jeff Noll installed a Chevrolet ZZ4 H.O. 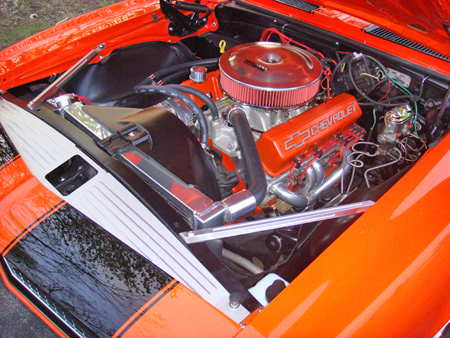 350 four-bolt-main GM crate engine in his orange Camaro. The engine is painted orange, too. The cast-aluminum heads are fitted with 1.94 intake and 1.50-in. exhaust valves. The motor uses cast-aluminum pistons with offset piston pins on forged, powdered metal connecting rods. It uses a 10.0:1 compression ratio. 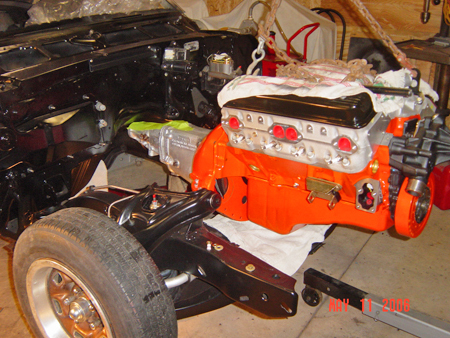 The die-cast aluminum Chevrolet valve covers are also painted bright Chevy Engine Orange. Jeff's motor included a nodular iron Corvette LT4 crank with rolled fillets. Another high-tech touch is a 208°/221° duration hydraulic roller-tappet cam with 0.474-in. intake and 510-in. exhaust lift. Induction is via a GM dual-plane intake carrying a Holley 670 Street Avenger four-barrel carburetor with an electric choke. The cowl-induction hood on the car provides more than good looks. It is fully functional. Jeff picked a High Energy Ignition (HEI) system with centrifugal vacuum advance. To exhaust spent gasses he used Jet Hot ceramic-coated Hedman "shorty" headers and a 2-1/2-in. Magnaflow stainless steel exhaust system with X-pipe. A Be Cool brand aluminum radiator handles cooling chores. Out-of-the-crate motors like the one Jeff installed in his Camaro provide enthusiasts with the "muscle" they want in their cars. A large line of different motors can be purchased from Detroit's automakers. 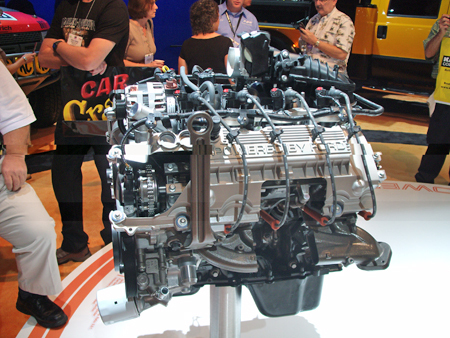 General Motors Crate Engines come in five "families" and numerous horsepower and displacement combinations. The engine families are the LS small-block V-8, the Chevy small-block V-8, the Chevy big-block V-8, RPO engines and racing engines. 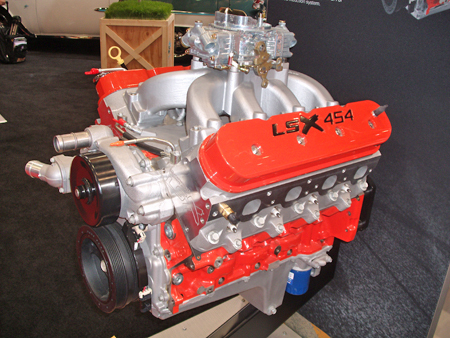 LSX454 is a Gen IV version of the 6.2-liter Chevy small block is sold in long block form. The 290-hp 350 HO Chevy small-block V-8 is a deal, especially if you consider that after 1971, the 275-hp 454 was the most powerful Corvette engine you could get for many years. With four-bolt mains, PM steel rods and strong cast-aluminum pistons, this crate motor can deliver reliability for years to come. 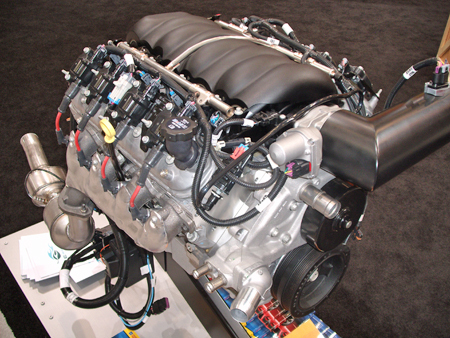 If you want factory fuel injection you can get a Ram Jet 350-cid/350-hp GM crate engine with iron Vortec heads. One of the nicest things about this power plant is that, once installed, all you need is a 12-volt power supply and fuel. You don't have to deal with a whole mess of electrical wires. The 383-cid stroker engine is one that rodders have built for years and now GM makes it at the factory. This is quite an impressive crate engine. It packs a whopping 425 hp and offers plenty of stump-pulling torque at 460 ft.-lbs. Emissions legal 454-cid (6.2-liter) GM LS3 seen here was used in the company's '55 Chevy E-Rod.It makes 430 hp and 424 lbs.-ft. of torque. If state-of-the-art performance is your need, it's hard to go wrong with GM's 320-hp LS1 350. this is the engine that powered the fourth-generation Camaros and Firebirds. The all-aluminum small-block V-8 comes complete with fuel injectors, exhaust manifolds and a flex plate. It also includes the ECM (electronic control module) and a wiring harness that allows it to be installed, teamed with a four-speed automatic transmission, in any 1975 or earlier vehicle. If you're fascinated by the big-block mystique, you can order a 770-hp, 572-cube GM big block V-8 straight from the factory. The old adage still rings true: "There's no replacement for displacement, at least when it comes to Chevy!" The base big block crate motor is the 454-cid/425-hp engine, which is priced to supply "bang for the buck." This is a good classic high-performance V-8 with big valves, rectangular ports, forged pistons, a forged crank, forged conncecting rods and four-bolt mains. At 500 ft.-lbs., it has plenty of torque, too. If 425 hp doesn't do it for you, there's always GM's Ram Jet 502 crate motor with aluminum heads. If you have enough to buy this engine, the fuel-injected 502-horse, 565 ft.-lb monster seems like a logical choice. Just like the small-block Ram Jet V-8, it needs only a 12-volt ground and you're ready to ride. GM's ZZ 572-ccid/620-hp crate V-8 is described as being "for those who consider excess to be barely enough." Judging from the specs, you won't get an argument here. It packs 650 ft.-lbs of torque to boot. One of these will set you back over five figures, but it is still a bargain. It does run on pump gas, too. The last GM big block crate on the list is the ZZ 572 Race Engine, which puts out 720 hp. This ZZ 572 puts a dent in your wallet, but if you're that far into racing, it's probably a buy. A custom-built racing engine would cost you lots more. The GM crate engines can be found at http://www.gmpartsdepot.com. Ford Motor Company offers five "families" of crate engines through its racing parts division (www.fordracingparts.com). They are called: Modular, Small-Block 302-Based, 351-Based, Sealed Race and Big-Block. The total array of offerings includes 20 different engines, some of which put out over 700 hp. 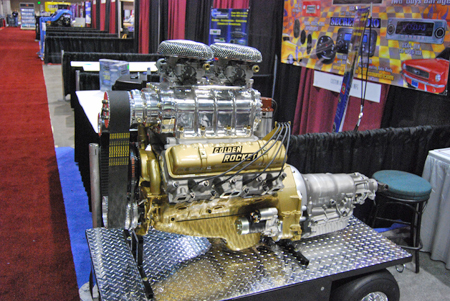 This "Powered By Ford" factory crate motor was on display in the auto company's booth at the 2009 SEMA Show. The Modular line offers 5.0-, 5.4- and 4.6-liter V-8 engines. The normally-aspirated 4.6 develops 320 hp and 320 lbs.-ft. of torque, while a supercharged version can deliver up to 700 hp. The 5.0 has a 412 hp rating and that goes up to 550 hp for the 5.4. Prices range from $8,000 up to $20.999 for the 5.4. The Small-Block 302 series offers five engines including three that actually have a 302-cid volume, a 306-cid and a 347-cid model. All but the 306 are "Boss" V-8s and the most powerful is the 450-hp 347 which comes with high-flow heads, hydraulic lifters, a forged crank and an MSD billet distributor. All five engines in the 302 family have hydraulic roller cams, forged I-beam connecting rods and lightweight forged pistons. Prices range from under $4,000 up to almost $9,000. Ford offers four engines in the 351 family, two of which displace 392 cubes and the others are 427s. The 392s are called Sportsman 351s. The 427-cid/535-hp engine is the Boss 351 and the other 427 is an aluminum block engine which no specific horsepower rating has been determined for. These engine all have many high-performance goodies and external appearance upgrades. Prices are in the $7,895 to $13,595 range. Ford's crate engine lineup includes six racing engines: 121-cid/180-hp; 302-cid/400-hp; 347-cid/350-hp; 347-cid/415-hp; 351-cid/400-hp and 374-cid/540-hp at prices from $7,100 (347-cid/350 hp) up to $29,500 (302-cid/400-hp). The racing engines are specially marketed and not a choice for Resto-Mods. On the other hand, both of the Ford big-block crates are popular with Resto-Mod builders. Both have 521 cubic inches and both produce 609 hp at 5750 rpm. Both also list 630 lb.-ft. of torque at 4500 rpm. In fact, both have nearly identical specs such as mechanical roller cams, forged pistons and 10.0:1 compression ratios. The difference is in the location of the T sump, which is in front on one motor and at the rear on the other one. Chrysler (www.mopar.com)â€”to make a pun on its latest adâ€”also "imports" three crate engines from Detroit. The first is an all-aluminum 426 HEMI® Gen III. If horsepower and speed count, this Mopar motor (P/N P5155513) could be what the doctor ordered. With 540 hp and 530 lb.-ft. torque it apes the classic HEMI's advantages. Lightweight aluminum adds performance through better acceleration, braking, vehicle dynamics and weight distribution. 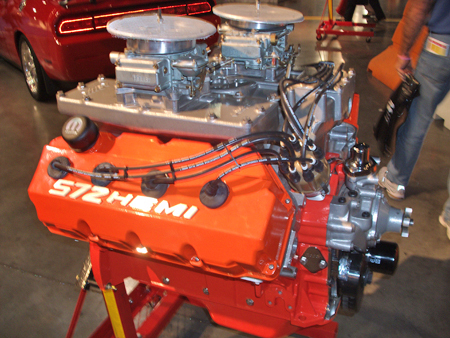 This 382 cid Mopar Performance Hemi crate motor was under the hood of a '72 Plymouth GTX Resto-Mod exhibited at the 2009 SEMA Show. It generates 535 hp and 550 lbs.-ft. of torque. Mopar 572 Hemi has optional cross rams and air horns. With its 10.0:1 compression ratio, it generates 560 hp and 660 lbs.-ft. of torque. 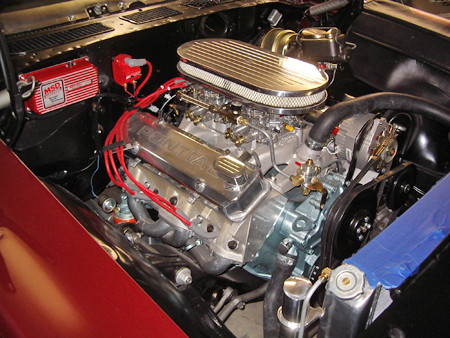 Another Mopar crate engine is the aluminum Max Wedge V-8 which can be had with cross rams. It features roller rocker arms, electronic ignition and many more up-to-date power enhancing options. Mopar's 440 Super Commando crate engine commands instant respect and admiration with a crate motor offering that gives you an estimated output of 500 hp and 535 ft.-lbs. of torque. With this engine under its hood, a Resto-Mod muscle car would pack plenty of punch both on the street or at the drag strip. Last, but not least, is the 410 Magnum "Six Pack" crate engine. If you put this engine into a Mopar Resto-Mod muscle car, get ready for a power boost unlike any you've experienced. With 465 hp and 500 ft.-lbs. of torque, this Mopar crate engine offering is packed with speed and performance capabilities. are many aftermarket companies that make/sell crate engines. Lingenfelter Performance Engineering (www.lingenfelter.com), Gale Banks Engineering (www.bankspower.com) and Edelbrock LLC (www.edelbrock.com) are three that come to mind. Catalog suppliers such as Year One, JEGS, Summit Racing and Speedway Motors are other reliable sources. It is a good idea to stick with "name brand" suppliers if you want to get the best reliability and guarantees. Many companies outside of Detroit are getting into the crate and custom-built engine market. Ross Racing Engines specializes in supplying parts and custom building services for the vintage Oldsmobile Rocket 88 V-8. Purchasing a crate engine from a less well known supplier doesn't necessarily mean you'll get ripped off. There are certainly small companies who make excellent products, sell them a bit cheaper due to lower overhead and stand fully behind their motors. A great way to feel safe dealing with such suppliers is to ask them to help you contact previous owners to see how their buying experience went. And if you are computer savvy, you may also want to check for Internet feedback from customers who previously purchased the same type of crate engine. Wise buyers always take these kinds of precautions. When you buy a crate engine, exactly what you get in the package you're purchasing can vary from one company to the next, as well as from one model to the next. Usually, you'll be buying an engine in one of three basic formats. Short-block: You get the engine block, crank, con rods, pistons and piston rings, pins, main bearings, rod bearings, cam bearings, rear main seal, and water jacket plugs. Some include the camshaft and drive mechanism. Long-block: You get all the short-block basics, plus cylinder heads, the camshaft for sure, and the valve train parts, plus an oil pan. Usually, you get the timing cover and valve covers and, possibly, the intake manifold. Make sure you know what you're getting, because what's missing can add to the total cost. Turn-key: You should get a ready-to-bolt-in engine, but do not assume you'll be getting a distributor, belt pulleys and such. Know what you're buying. Everything you have to add to get the engine going in your car—from a distributor, to spark plug wires, to an oil dipstick—is going to cost you money. Do you want air conditioning? If so, you better look for the best deal on a crate engine package that includes all of the needed air conditioning system parts. Ken Ligenfelter's Indiana company focuses on high performance and offers several aftermarket crate engine packages. Engines are heavy and cost a lot to ship. Have you figured those costs into the budget for your Resto-Mod project? Engines are expensive, so you'll want shipping insurance, too. And when the engine comes, be there to check its delivered condition. Signing off on the delivery condition will be your responsibility. The price will also dictate any taxes due. And just because your state doesn't require sellers to collect sales tax on mail order purchases, don't assume you're not liable to pay such a tax. Such taxes are supposed to be voluntarily reported when you file your income taxes for the year.